Ruth and I had been invited by Invacare/Küschall to visit their factory in Basle, Switzerland to see the progress of the Everest Chair and take the opportunity to meet with the team behind the design and build project. 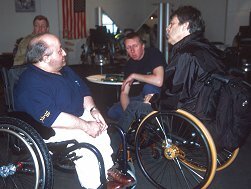 Prior to our visit, I had requested certain modifications to the standard design of the wheelchair, based on first hand experience gained from the team training weekends. 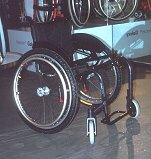 These modifications were made, choosing from the available range of adjustments and included height adjustments to the push handles, different seating position and adjustments to the camber of the wheels, amongst others. We arrived in Basle late on Sunday night, and were collected from our hotel by Kathleen the Küschall Marketing Manager the following morning and driven the short distance to the Küschall factory. After an introductory tour of the factory by Sheki, we were introduced to the rest of the team involved with this project, including Stefan a keen climber and walker himself, who has been specifically tasked with this chair. Rainer Küschall, the founder of the business and a wheelchair user himself, was also on hand and provided the regular brainstorming sessions with some first hand knowledge of wheelchair use over difficult terrain. Measurements for the 'prototype' chair had been taken some two months previously in the UK and I was both delighted and surprised to find that they had been interpreted accurately to provide such a perfect fit! For me the chair was superb, it was comfortable, light, easy to manoeuvre and Ruth would have me mention - a beautiful colour! 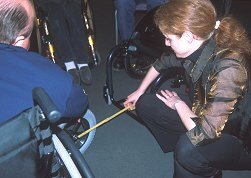 However, at this point, the Chair looked like a Chair and we immediately started making the adjustments we felt were necessary, which included adjusting the seating position and altering the camber of the wheels for greater stability. A few head scratching sessions later, and having been joined by additional members of the Küschall business such as Christina one of their engineers, and Jarl, the Managing Director the chair began to transform something resembling an off-road piece of equipment. 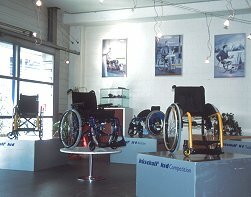 Other Küschall wheelchair models were brought from their podiums and turned upside down for comparison of components and design, and various components were also brought forth from the workshop for consideration. Finally, as the day drew to a close, we concluded that despite leaving Stefan and the team with rather a lot of work to do, the visit had been wholly worthwhile. The Everest Chair is currently undergoing those additional modifications in Basle, and we are being updated regularly via text and pictures from the factory with the progress of those changes. We expect to see the Chair in its most completed state here in the UK by the beginning of April for its first 'road test'. The Küschall team could not have been more hospitable or helpful and Ruth and I had a thoroughly enjoyable visit - thanks for the choccies, which we're saving for the Expedition!! !